This dish produces the most flavorful, juicy shrimp you have ever tasted. The flavor of the shrimp isn't completely masked by the seasonings and doesn't get dried out because of the deep frying. Now usually this dish is on the spicier side, but again, you can cut down on the pepper and no one would miss a thing. 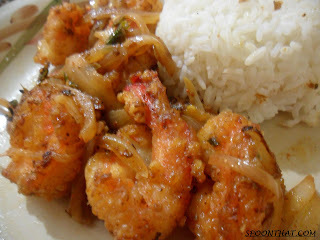 This dish also HAS to be prepared with jumbo shrimp, as big as you can find or else the taste will come out different. 1) Mix the egg and cornstarch with the shrimp and a little salt and pepper. 2) Heat the oil and deep fry til the shrimp are golden brown and cooked through. 3) In a large skillet, add the sesame oil and garlic and fry til they change color. 4) Add the onions and chillies and stir fry on high heat til they just loose their edge, but still maintain their firmness. 5) Add the shrimp and everything else and stir fry the whole thing until all the flavors come together and the dish dries out. 6) Serve on a bed of steamed rice.